Oops - we don't appear to have a video for the fi-5750C. 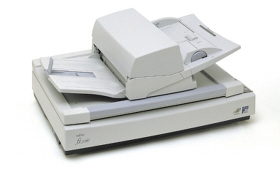 A unique feature of the Fujitsu Fi-5750C document management scanner is the rotatable ADF, which allows easy access to both left and right handed alike. Its automatic document feeder will handle up to 200 sheets at a time, freeing you to do other things. The hopper can accept both square edge and fanned paper stacks helping to eliminate paper jams and increase overall scanner productivity. To improve the accuracy and reliability of scanning the Fi-5750C incorporates ultrasonic double feed detection. Developed from the popular Fujitsu Fi-4750C/M4097D 50 ppm model, the Fi-5750C can scan in full 24 bit colour enabling all the nuances of your documents to be captured.